Michael Douglas has had quite a life. The actor/producer/son of Kirk Douglas has won Emmy and Golden Globe Awards. He’s a political activist, and the husband of Catherine Zeta-Jones. He spent some of his growing-up years in Westport. He did not go to Staples High School — his parents shipped him off to Choate — but he did join the Downshifters. That’s the hot rod club that flourished here in the 1950s and ’60s. Michael Douglas is still making movies. 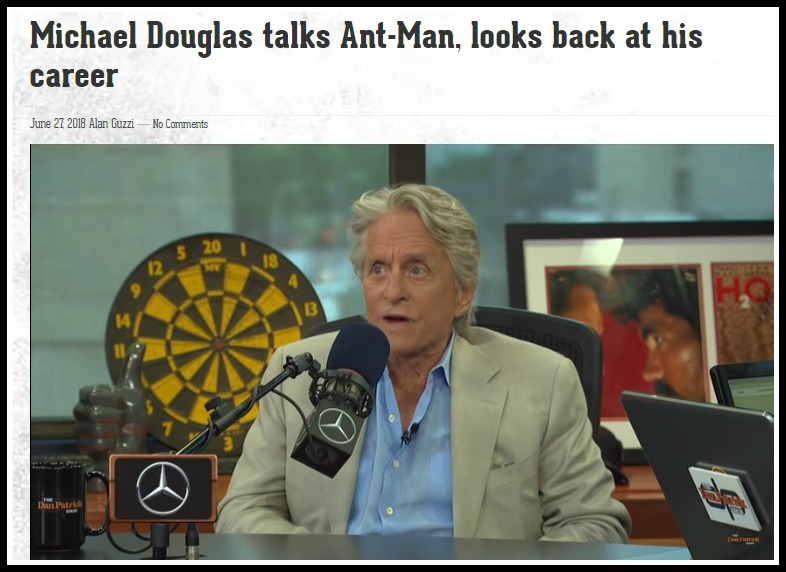 And while promoting “Ant-Man” on Dan Patrick’s radio show this week, the talk turned to those long-ago days. A screen grab from the Dan Patrick Show website. He said he pretended to be a tough guy. “Tough being a tough guy in Westport,” Patrick noted. And that was that. Host and guest moved on to other things. But it’s nice to know that in some ways, Michael Douglas has never moved far from the Downshifters. This entry was posted in Entertainment, Looking back, People, Staples HS, Transportation and tagged "Ant-Man", Michael Douglas, The Dan Patrick Show, The Downshifters. Bookmark the permalink. Had the pleasure of meeting Michael and his brother Joel at Treasure Cove Camp in Stinson Lake NH about 100 years ago! Father Kirk flew up on a seaplane for parents day right after he made The Viking. Michael and Joel Douglas first appeared at Bedford Elem.On Sat mornings they came to Joe Mendola’s Art Enrichment class at Seabury.I walked up to Michael and said “you look like Kirk Douglas”His reply was I should He ‘s my father “Great news to tell my mother when she picked me up.They attended Bedford Jr High until the rumors started flying and the guidance counselor and parents decided Choate would be a better alternative. there was the Piston Riders and my ride was an Austin Healy 100A. I remember seeing Michael and Kirk when they came to visit Michael’s brother, Joel at Burr Farms Elementary School. Everyone ran to the windows to take a look at them. They were wearing suits, and I couldn’t understand what all the commotion was about. I was eleven at the time. Joel sat behind me in Mr. Pierce’s sixth grade class — he was friendly and a very nice kid — when my family moved to CA later that year, Joel gave me his father’s phone number and told me to call him because his father would show me all around LA. At the time, I had no idea Kirk was a movie star and couldn’t imagine calling him. So I threw out the phone number. Probably would have had a wonderful time!! Oh the downshifters and the memories. They would frequently, in the very early years, congregate in our driveway and work on their engines. Parents Magazine cited them and the Westport YMCA as a positive influence on the young mem of the town. I have that letter somewhere in my files along with a better picture of the guys around my brother’s ( Corky Cookman) Model A Ford Roadster, also taken in our driveway on Calumet Road. Those were the days my friends, I wish for all the young men and women now growing up in Westport that they would never have had to end. I couldn’t copy a picture here so I sent one to Dan. His mother Diana was a nex5 door neighbor on Whitney Street in Westport when I was a boy in the 70’s. Micheal had moved out many years before. When Diana moved I became friends with the son of the new occupants. Together we found boxes of Mike Douglas memorabilia upstairs in the barn/garage. Essentially TV Guides, People Magazines, etc. that featured Michael Douglas. They didn’t mean much to me then, but now I appreciate his Westport connection more because of that. Why care about this actor and his weak Westport connection? This club sounds cool enough without him. (If only needless name dropping would end, Westport would become somewhat normal). After you’ve done that, please fulfill your previous promise and just leave. You have worn everyone’s patience to the breaking point. I get at least one email a day from readers asking why you are lobbing these comments over the border at us, in a town you haven’t lived in for decades. We don’t care what you think about every post. You waste everyone’s time with your inane comments. Just go. I am giving my opinion. Free speech. True and fair enough I suppose. I used to be Canadian. I remember we had a reputation as civil, co-operative, humorous, friendly, and quick to praise and compliment. You may have posted something that comports with that reputation, but rarely enough that nobody seems to remember it. Lots of folks who haven’t lived here for a long time comment on the blog, but almost always with fond memories and interesting stories. Do you have any of those? Or just an endless supply of cavils and and holier-than-thous? 06880 simply doesn’t want opinions outside it’s borders. It is a club, and always will be. p.s. I’ve written many fond memories here, and still do. Nancy, your constant trolling comments — on anything and everything, without any knowledge of what you’re talking about — is “significantly unpleasant” to many “06880” users. They have asked me frequently to ban you. I have resisted so far. But understand: You are trying this online community’s patience. DW: You are, in a word, awesome. Have a good evening. Nancy, the record of your constant trolling is public and easily retrievable. One cannot exaggerate the patience Dan has shown you on HIS blog; it’s actually quite stunning. Yes, Jack, I have vented about the state of affairs in Westport, the State, the country, as have you. What is the difference? My reason is pure interest in Westport, the State, and the country. Many ex-Westporters could care less. Sorry if you feel threatened. Not my intention. Have never felt threatened by you, But I do appreciate the apology just the same. I have no problem with you or your right to speak up as you wish – but you are consistently negative on this hometown blog, even where the topic doesn’t invite negative comments (like this topic, for instance). It seems you have a serious axe to grind with this Town and/or the people who live here, and this blog actually celebrates Westport. If you dislike Westport and its people so much, why the heck do you even read 06880? There have been plenty of negative comments on this blog from readers everywhere, on many subjects. Let’s balance the negative and the positive. Otherwise there is no point to any forum. Hometown memories stick. Sorry for being brash. Nancy: Michael Douglas has spoken or written on multiple occasions about some aspect of his time in Westport. (I think that during his school years he lived at least as many years in town as your brother Tim did—and you know that time in Westport was very meaningful to Tim). In a previous story Dan wrote, one of the commenters even remembered Michael showing up at a Staples reunion (even though he didn’t graduate from Staples)—so that would seem to be more evidence that Michael Douglas feels a connection to Westport. Plus, his mom lived here for many years and was a respected figure in town. Fred, I’m just not a fan of Michael Douglas. What my brother has to do with it is moot. My opinion. I wonder how many of youse “gear-heads” remember Drag racing on the Connecticut Thruway in Darien around 1953. Darien’s was the first section completed but was blocked off to motorists and the public until the entire thru-way was opened. Yet, we gear-heads had a Secret Back Way to get onto the pavement for our drag-racing late at night. It was loud and fast. I remember Johnny Bohr and his “full-blown” (souped-up) Mercury convertible just out of the shop. The engine hadn’t been broken in and he was urged to NOT drag race as it could damage the machine. He didn’t listen, and half way along the strip, his engine caught fire. O-WELL? A friend of mine went to a Bedford Junior High dance with Michael Douglas and she found it super cool and a great memory .His mother often brought sporting equipment and out grown nice clothes to the Barter Bar .Michael ‘s‘s escapades At BJHS are best left to the memory bank as I would not like to offend anyone. The guidance counselor and principal were happy to see him leave.He certainly livened up the place. Funds for the Staples Players we sent a letter to Michael Douglas and yes he sent us a very nice check.Still rememberMr.Matheson ‘s surprise at receiving it and his calling me to say Michael Douglas sent us a contribution. While I admire Nancy Hunter’s candor (and just realized that she was a neighbor of mine on Hitchcock Road) the point of the story is that Micheal Douglas, the son of a very famous movie star at the time (despite his parents being divorced) was very much a part of the fabric of the town of Westport. He played on my Little League team as well as pumped gas at the Mobil across from the Playhouse. There was no sense of entitlement which saturates our town today. I found this story and much of the commenentary attached most interesting. Primarily as a newbie to Westport and learning more of it’s history. Which this blog is a terrific outlet for. For the record, the residents and my new neighbors have been nothing but gracious and welcoming. And one of them just happens to be a celebrity. Which makes no difference to me as long as they are good folks, which they are. A lot of the negative town bashing citizen commentary I’ve yet to experience, but hey, it’s all in the company you keep. Regarding your decision stated here Dan on who stays and who goes, I’ll simply recite something my father said to me on his deathbed when I was 12 years old. “Son, in your life you will meet two kinds of people. There are energy givers, and energy takers. Cultivate and love the givers, and eliminate the takers”. Finally, as someone that spent a very large portion of my youth growing up in Canada, I’ll respectfully disagree with Ms Hunter that it means nothing. You will not find better folks on earth than our friends up north,. In today’s society especially, a large portion of American citizenry (of which I am) could use a dose of their compassion, behaviors, and life outlook. I used to think about Michael Douglas wherever I’d pass 59 Whitney Street, near the Roseville Road intersection. The lovely house and the red barn look the same (amazingly for Westport) as when Michael lived there. And in 2015 our Staples Class of 1960 had a 55th reunion in the home of Beau James in Weston. He’s the younger brother of Michael James, who was in our class, and both were in the Downshifters. So we decided to have a very well-attended talk about the club in a room at the Library as part of all the activities. Guys brought memorabilia and reminisced. We all learned so much. Michael Douglas was traveling, so couldn’t come, butI I remember Lance Gurney and Doug Fenton and so many others there! 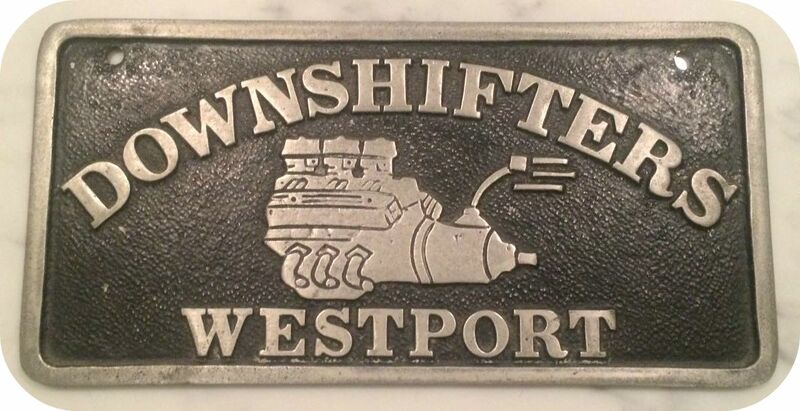 The Downshifters were an important part of our town in the 50s and 60s. Westport is always in one’s bones if you lived there as child and young person. I remember the cool tough guys in the 60’s around town. They were a total fascination to a young grade schooler. Love reading 06880 every day. Keeps me young – the memories all intact. The fact that we are all still talking about this post more than 24 hours after it first appeared speaks volumes. I remembered that I read somewhere about the way the guys policed themselves. I knew this anyway but was sure it was written somewhere and it was……… in……. 06880! An example of the Downshifters policing themselves and looking after each other. I’m not sure of the exact year but it might have been 1964 or 65. My brother Corky was at Fort Dix in basic training. I was home for the weekend and drove his car to town to have the antifreeze checked since a hard freeze was expected. I stopped for a quick bite to eat on the Post Road. All of a sudden one of the down shifters came in and scanned the restaurant, fast food I’m pretty sure, saw me and said: “What are you doing driving Corky’s car?” I explained and he then went with me while I had the antifreeze checked. So, long after High School they were still a group that cared for and helped each other. Last night I was looking through what I have saved about the Downshifters. I’ll send Dan a copy of the letter commending them on their award from Parent’s Magazine. Perhaps he can use it in the future. Thanks for the memories. Yes, BJ Westport is in our bones. Thank you, Mary — what memories you share! I remember all of these cool young guys in fast cars in Westport around the beach and downtown! Fascinating era in Westport. Looking forward to more old photos and memories. I will always love Westport as part of my dna. I’m in Portland, OR area now which strangely, reminds me of Westport in some ways. I wish I could get a hold of old family photos of our times in Westport — I hope too one of these days. I too find Nancy’s comments negative. Michael Douglas is a huge star director, etc, his Dad perhaps even more so. Westport has been home to several celebrities, Paul Newman comes to mind. I lived in Westport in 67/68 as an au pair. I believe some my friends who graduated from Staples in 63/64 had gone to school with Mia Farrow, (I could be wrong). My Dutch girl friend, became good friends with Steve Emmett, and I knew Steve as well, his dad was a well know Hollywood producer, and as far as I remember the family was bicoastal. We went to his house in Westport, and everyone was so nice and friendly. The family became very fond of my Dutch girl friend, and went out of their way to celebrate her 21st birthday. Coming from Europe where, back then, there was much more of a class difference, this was really eye opening for us. We were just simple au pairs, nothing special, yet we got treated like royalty. My biggest regret is that I never saw Paul Newman, while living in Westport.